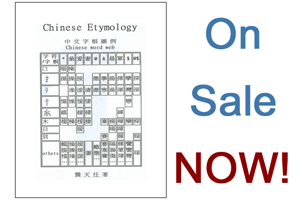 Read through the Course Overview (review www.chinese-word-roots.org ). This is a summary and lead-in to the course, the information provided will help us understand what we will be looking at in the following assignments and lessons. I began my studies on March 17, 2008 and I read through the Course Overview and completed Assignment 1 in just a matter of minutes. I am first generation Chinese and I have lived in the United States my entire life. I always wanted to learn Chinese simply for the sake that it is part of my heritage, but never in my youth was I presented the opportunity to take a Chinese course. In fact, there were very few Chinese courses offered in my region. Moreover, those courses’ success rates were very low and deterred me from enrolling. When I first looked at this website and the Chinese word root system I was completely awestruck! I admit that it was hard for me to believe that something so seeming complex as the Chinese written language could be so simple. However, despite any skepticism, I knew right away that this was the only way to study the language!